Stay connected with AIDS Care by reading monthly Newsletters and praying for current needs. 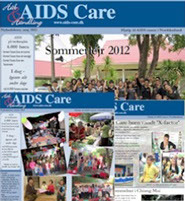 If you have any questions you may contact us at info@aids-care.net or fill in the contact form. To support the project, please keep praying for AIDS CARE and make a donation.